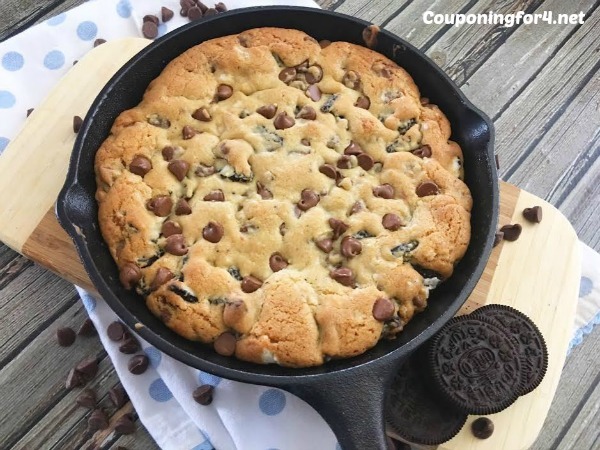 There aren’t many things that my kids like more than Oreos and chocolate chip cookies, and if you have the same thing going in your home, you’re going to LOVE this Cast Iron Oreo Chocolate Chip Cookie recipe! It’s absolutely delicious and looks really cool once it’s finished! Make this for your family or be a hit at your next gathering! Preheat your oven to 375 degrees. Grease your cast iron skillet by rubbing a little vegetable oil into the pan with a piece of paper towel. In a large mixing bowl, combine your sugar and butter and mix with a hand or stand mixer. Add in your egg and vanilla and mix well. Next add your flour, salt, baking soda, baking powder and mix well. Stir in your crushed Oreos and chocolate chips. Scoop your cookie dough into your cast iron pan (already greased!) and press down with your fingers. Cook for 25 minutes and remove from the oven to cool. Enjoy! Grease your cast iron pan by rubbing a little vegetable oil into the pan with a piece of paper towel. In a large mixing bowl, combine your sugar and butter and mix with a hand or stand mixer. Add in your egg and vanilla and mix well. Next add your flour, salt, baking soda, baking powder and mix well. Fold in your crushed Oreos and chocolate chips. 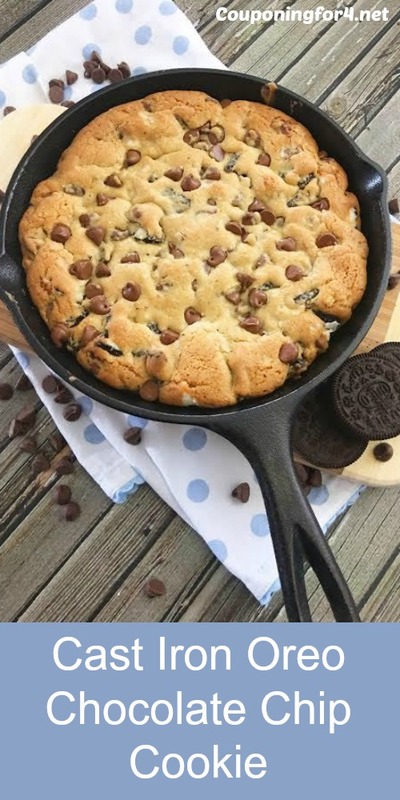 Scoop your cookie dough into your cast iron pan and press down with your fingers.